When you’re on a list that includes Neil Armstrong, Hank Aaron, Gerald Ford, Bill Gates and Walt Disney, you must have done something right. But “something right” doesn’t begin to describe the 10 volunteers who join the list of Silver Buffalo Award recipients this year. “Something spectacular” is more like it. Combined, they have given nearly 400 years of service to Scouting. The Silver Buffalo Award was first presented in 1926 and is awarded to people who give noteworthy, national-level service to youth. It comes with a red-and-white Silver Buffalo Award medal, a red-and-white square knot for wear on the uniform — and the undying thanks of the BSA. The Silver Buffalo Class of 2018 includes men and women who have served Scouting in many ways — improving training, revising the Cub Scout handbooks, encouraging Scouts to do their Duty to God, developing Scouting’s philanthropic foundation, staffing Jamborees and much more. The 2018 recipients have distinguished themselves outside of Scouting as well. The list includes the owner of a trout farm in Georgia, a Las Vegas real estate investor and the president of the second-largest Taco Bell franchisee in the country. Also honored this year: María Molinelli, who becomes just the second person — and first woman — from Puerto Rico to receive the award. The Silver Buffalo Awards will be presented during the the BSA’s annual meeting this week in Dallas. Please join me in congratulating each of these outstanding volunteers for a job well done. The * indicates the recipient is an Eagle Scout. For Linda Baker, education is a theme that has influenced her life and made it possible for her to positively impact others during her 40-year tenure as a Scouter. As chair of the New Member Coordinator Task Force, she has put her research on the values and expectations of millennial parents to good use in helping others understand their needs and perspectives. Her love of learning motivated her to return to college to earn a doctorate at the University of Albany after many years of teaching English at the high school level. That educational background has served her well as a current member of the Cub Scout Handbook Revision Task Force. A 2015 recipient of the Saratoga Good Scout Award, Baker is currently a local troop committee chair and the vice president for program for the Northeast Region. She has distinguished herself as a district commissioner, council commissioner, council membership vice president, council program vice president, area membership vice president and area camp accreditation chair. At the council level, she is a member of the executive committee and executive board, sits on the volunteer recognitions committee, and is the Wood Badge coordinator. Her Scouting honors include the Silver Antelope and Silver Beaver awards. Additionally, she was recognized as a Vigil Honor member of the Order of the Arrow. In addition to her own Scouting accomplishments, Baker’s late husband, Charlie, was a dedicated Scouting volunteer, who was recognized with the Silver Beaver Award and was a Vigil Honor member of the Order of the Arrow. Scouting was a family affair for the Bakers; her daughter acted as a behind-the-scenes BSA participant and resource while her son, an Eagle Scout, was a lodge chief and Vigil Honor member of the Order of the Arrow. For Terry Bramlett, what drives him is “creating opportunities for more youth to participate in the Boy Scouts of America by developing tools, information, best practices, and training that build, foster, and maintain positive relationships with schools and educational organizations.” That academic focus earned him the national Elbert K. Fretwell Outstanding Educator Award this year. An Order of the Arrow Legacy Fellow, he has also been honored with the Philmont Training Center Masters Track Award, Silver Antelope and Silver Beaver awards, and William T. Hornaday Gold Badge. Other honors include the Scoutmaster Award of Merit and District Award of Merit. He is a Vigil Honor member of the Order of the Arrow. Active on the national level, Bramlett has served as chair of the Education Relationships Sub-committee and the Strategic Analysis NCAP Committee. Other memberships include New Member Coordinator Task Force, National/Community Alliances Committee, Membership Committee, Philmont Training Center faculty, and the New Unit and Retention Task Force. Bramlett is active in the community, having served 14 years on the board of education, and also serving on the school council and as PTO president. Additionally, he volunteers with Relay for Life and the Special Olympics. He is a deacon at Sugar Hill Baptist Church. A business owner and outdoor enthusiast, he enjoys travel, water sports, riding motorcycles, hunting and fishing. He and his wife, Ruth, have two children: Eagle Scout Payton Bramlett, Esq., and Dr. Leigh Ann Bramlett. Among John Brown’s proudest accomplishments in Scouting was being chosen in 1971 as the Scoutmaster of the Chicago area contingent to the world Scout jamboree in Japan. That experience allowed him to learn much about the host country and its culture, while also shouldering and fulfilling the responsibility granted him. During his 65-year tenure as a Scouter, Brown has served on the staff at 24 National Order of the Arrow Conferences and 10 national Scout jamborees. He was also appointed national headquarters staff for the world jamboree in Holland as well as the national staff for world jamborees in England and Sweden. An Eagle Scout with a Silver Palm, he has received the Silver Antelope and Silver Beaver awards, the Whitney M. Young Jr. Service Award, the District Award of Merit, and the Order of the Arrow Founder’s Award. He is a Vigil Honor member and a recipient of the Distinguished Service Award of the Order of the Arrow. On a regional level he has completed the Wood Badge course, and taught on the staff at Philmont. As a youngster, he recalls being mesmerized as he watched older Scouts in his neighborhood church enjoy meetings and other activities and then head off to Scout camp. At that time, he decided that he must become a Scout. Brown is now active at New Faith Baptist Church in Matteson, Illinois, where he also serves as historian for Troop 120. He encourages the Scouts in the troop to work to achieve the highest honors possible in Scouting and in life and to live by the Scout Oath and Scout Law. A retired educator, Brown and his wife, Ethel, have two children. 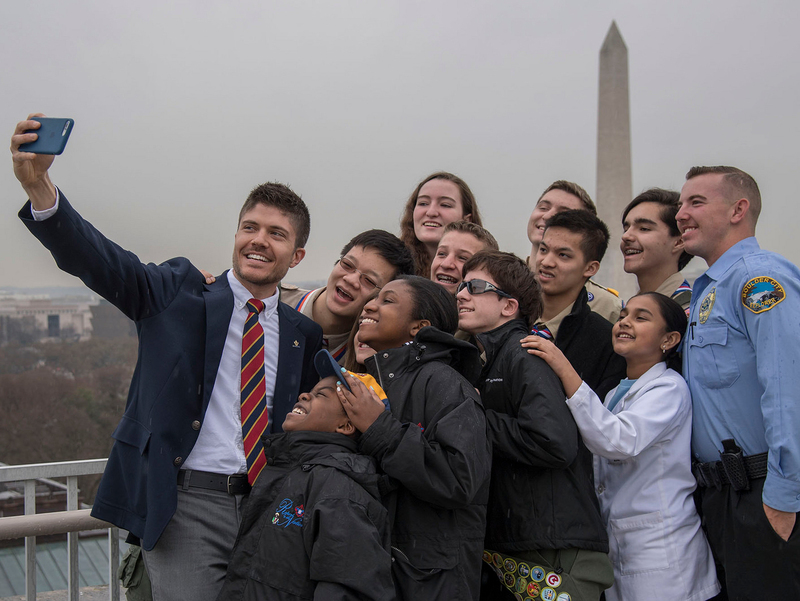 With more than 20 years in volunteer Scouting leadership, Howard Bulloch is most pleased with his role in instituting the President’s Leadership Council, a major gift-giving society, while serving as the BSA National Foundation chair. In that capacity, he was responsible for arranging several recognition art gifts to major donors and continues to devote himself to the arts by serving as a member of the National Museum Committee. Today, the President’s Leadership Council has grown to 55 member families, while the National Foundation sponsors special events for major donors each year. Bulloch has been serving as a National Executive Board member since 2009, and is the National Advisory Council chair. A recipient of the Duty to God (LDS) award and the Silver Beaver Award, he is also a James West Fellow. At the council level, he is a former president of the Las Vegas Area Council and continues to serve as an executive board member. He is a member of the National Eagle Scout Association and the 1910 Society. As a member of The Church of Jesus Christ of Latter-day Saints and a graduate of Brigham Young University, he has supported dozens of LDS missionaries, college scholarships, and a local LDS camp for girls. From a family of 11 children, Bulloch is proud to be the first Eagle Scout in his family’s history. The owner of an investment company, Bulloch and his wife, Cristi, have two daughters, an Eagle Scout son-in-law, and one granddaughter. For Larry Coppock, a Scouter for almost 40 years, agreeing to sponsor Evan Hunsberger’s Eagle Scout service project, which updated Strength for Service to God and Country, was a watershed moment. The book of devotionals, originally published to inspire and support soldiers during World War II, has become a best-seller, with more than 550,000 copies distributed to military men and women since 9/11. As the national director of the Scouting ministry of the General Commission on United Methodist Men, this project fit beautifully into his area of expertise. Devotion to the ministry is a prevailing theme for Coppock—both professionally and as a Scouter. He has led United Methodist chaplains and volunteers to five national jamborees, and created three Scouting awards (Shepherd Church, Silver Torch, and Good Samaritan). For 21 years, he has served as the national director for Scouting ministries of the United Methodist Church, is a member of the Religious Relationships Committee, and served on the Duty to God Breakfast Committee. This year he is being honored with the National Duty to God Award. He is the editor of the United Methodist Scouting Guidelines book and the Scouting News newsletter. Regional responsibilities have included directing the United Methodist Scouting ministry leader training for the high-adventure bases, providing 17 years of service at the Philmont Training Center, and initiating new denominational training at Florida National High Adventure Sea Base and the Summit Bechtel Family National Scout Reserve. Coppock and his wife, Diane, are proud of their three children and eight grandchildren. Craig Fenneman’s proudest achievement in Scouting is having been instrumental in starting the BSA National Foundation Capital Campaign. An Eagle Scout with more than 30 years in Scouting, he has received the Silver Beaver Award, the Silver Antelope Award, and the Distinguished Eagle Scout Award. A member of the Hoosier Trails Council, Fenneman has served as council, area, and regional president and has been on the National Executive Board and National Executive Committee. Other elected and awarded positions include serving as an assistant Scoutmaster, national marketing committee member, Central Region marketing vice president, and chair of the National Foundation board. As the owner of a real estate and investment firm, he has been honored for his business acumen as the Ernst & Young Indiana Entrepreneur of the Year in 2007 as well as receiving the Regional Outstanding Operations Award and the Lauraland Award for National Outstanding Development Franchisee — both from Taco Bell Corp.
A firm believer in doing his civic duty, Fenneman is involved in numerous civic and professional activities including sitting on the board of trustees for Butler University, the board of directors for the YMCA’s Camp Carson (where he received the Outstanding Volunteer Award and is a member of their Hall of Fame), and the board for United Way of Central Indiana. Fenneman and his wife, Mary, have six children and five grandchildren. A geologist by profession and the recipient of the Geological Society of America Distinguished Service Award, Dr. Jack Hess has used his professional training to enhance his Scouting activities. His proudest achievement was serving as the incident commander for the Manti-La Sal site of the ArrowCorps5 service project. In that capacity, he helped assemble a great team of youth and adults to complete a project that has yielded positive results for the Buckhorn Wash environment in southern Utah, setting an example of service to our public lands. With more than 50 years in Scouting, Hess has been recognized as a Distinguished Eagle Scout and received the Hornaday Gold Badge, Silver Antelope Award, Order of the Arrow Distinguished Service Award, and Silver Beaver Award, and earned Wood Badge beads. He is a Vigil Honor member of the Order of the Arrow. The Order of the Arrow has played a large role in his life, with Hess having served on the National Order of the Arrow Committee, as the chair of the Western Region Order of the Arrow, as area Order of the Arrow adviser, and, at the council level, as executive board member and lodge adviser. Hess has also served as jamboree staff and on the National NCAP Committee. An avid outdoorsman and amateur radio buff, Hess and his wife, Letitia, have two Eagle Scout sons. For Bill Loeble, being a positive influence in the lives of young men he has advised, who then grew into leaders who positively influenced the next generation, is what Scouting is all about. As a Scout for 10 years and an adult leader for 53 years, Loeble can be proud of his combined 63 years in Scouting. Nationally, Loeble has been a member of the National Order of the Arrow Committee, the National Museum Committee, and the Membership Standards Committee, and served on staff for 13 National Order of the Arrow Conferences and two national Scout jamborees. Regionally, he has served on the executive board, was chair of the Order of the Arrow committee, and is a member of the NCAP committee. A recipient of the District Award of Merit, Silver Beaver Award, God and Service Award, and Order of the Arrow Distinguished Service Award, Loeble has also earned the Silver Antelope and the Philmont Training Center Masters Track. He has earned Wood Badge beads, and served as area program vice president and area Order of the Arrow section adviser. Loeble has served as an elder and clerk of session at the First Presbyterian Church in Covington, Ga., where he and his wife, Diane, live. They are the proud parents of a son, who is an Eagle Scout, and a daughter. They have four grandchildren. For more than 30 years, María Molinelli has helped train, mentor, and inspire thousands of participants in Scouting. After holding diverse vice president positions in the Puerto Rico Council, she served as board president from 2002-2007. She continues to be involved at district, council, area, and regional levels. When her council was struggling financially, she was tapped to use her talents to deal with the financial hardships plaguing the council and was able to pull the council out of the conditional charter in which it had been placed. In the three years since, she has continuously worked toward improving camp facilities and programs, establishing a campership program to provide financial assistance to Scouts in need, and reversing the membership loss that had afflicted the council for many years. After Hurricane Maria, she led the council’s hurricane recovery efforts. A Vigil Honor member of the Order of the Arrow and Founder’s Award recipient, Molinelli was also adviser for Yokahú Lodge and has served on the regional Order of the Arrow committee. She helped organize the first conclave ever held in Puerto Rico. Molinelli is a James E. West Fellow, and 1910 Society and Second Century Society member. She has been recognized by the Interamerican Scout Foundation as a member of the Order of the Condor, and she recently became a Baden-Powell Fellow for the World Scout Foundation. At the council level, she holds the Silver Beaver Award and the District Award of Merit. At the regional level, she is the recipient of the Silver Antelope Award. Molinelli and her husband, Teófilo, have two sons, both Eagle Scouts, two daughters, and a granddaughter who will soon join Cub Scouting as a Lion. As a youth, Brian Williams was proudest of becoming an Eagle Scout with Palms, being the senior patrol leader of his troop, and serving as junior assistant Scoutmaster for the 13th World Scout Jamboree in Japan. As an adult, he enjoyed being Cubmaster for a pack with his two sons. In Scouting for 37 years, Williams has been a member of Wood Badge staff on five separate occasions and received the Silver Antelope and Silver Beaver awards. He has served as Central Region chief for the national Scout jamboree, and made numerous visitations to various high-adventure camps. Regionally, he has served as president and vice president. Williams was the first regional commissioner in the nation. Believing strongly in the Scouting principle of leaving a campsite or meeting room “just a little better than we found it,” he continues to apply that principle in his own Indiana community. His civic duties include serving as Rotary president, national secretary of the Indiana University Alumni Association, president of the Indiana University Maurer Law School Alumni Association, and president of the Indiana University Alumni Board of Aeons. When not engaged in professional activities as managing partner for his law firm, he enjoys travel, canoeing, hiking, and orchid horticulture. Williams and his wife, Barbara, have two sons, both Eagle Scouts, and live in Evansville, Indiana.